Chrichton's World: Review 10 Cloverfield Lane (2016): "Oh come on". This is a disaster of a movie and not the good kind! Review 10 Cloverfield Lane (2016): "Oh come on". This is a disaster of a movie and not the good kind! "Oh come on". These are some of the final words of character Michelle played by Mary Elizabeth Winstead. And those exactly word the thoughts I have about this rubbish film. 10 Cloverfield Lane is absolute crap. This is coming from someone who wasn't liking the original that much. But I still think that one at least had some merit and is better than this sequel. There is nothing fresh, original or remotely good about this film. My main draw was John Goodman and he certainly was adequate but creepy, scary or terrifying? Not by a long shot. I was expecting some cat and mouse play between Michelle and Howard (John Goodman). But everything that happens to and between them is completely predictable. The so called twist ending is one you can see coming from miles away. And even if you are truly oblivious there hardly is a point to it. The first 80 minutes have almost nothing to do with what happens in the finale. In fact it can be seen as one of the many excuses Howard must have been using to fool his guests. It does not matter if it is real or not. There is no significance to it whatsoever. What did I think of the last twenty minutes? You know I am a sci fi nut but I detested this. It's one big mockery and insult to my intelligence. Let me remind you that I for the most part love cheesy B flicks. So if I can't find enjoyment in those last minutes that much then you just know it's bad. And to be honest it's not that those last minutes were not entertaining. They certainly were. But it's the fact that it does not blend with the rest of the film at all. 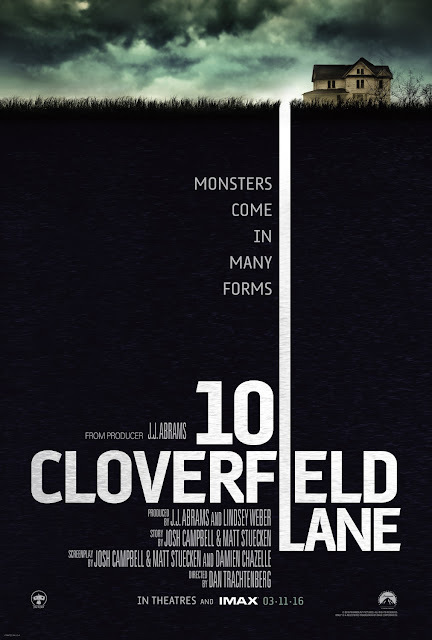 It's like they had forgotten this was supposed to be a follow up to Cloverfield and then quickly thrown in some elements to strengthen the connection. Just pathetic. I seriously fail to see how people can praise this film since there was zero tension in this film. It was completely absent. And mostly because I didn't care about any of the characters. I know that we are supposed to root for Michelle. But why should we? We hardly know her. So yes she is not a damsel in distress. She is the hands on and proactive type. But she is also unbelievably stupid. There are so many things she could have done. No what do we get instead of some bone chilling and hair raising tension? Two men and a woman playing board games while listening to jukebox songs like " I think we are alone now ". Oh joy! No, seriously. This is easily one of the worst films I have seen this year. Don't believe the hype. Those people claiming this is good are lying. They are just praising it because J.J. Abrams is involved. And as you know he is one of those very flawed directors and producers who apparently can do no wrong. Even when he screwed up Star Trek and Star Wars. Oh yes I am truly worried and terrified for the future of mankind.